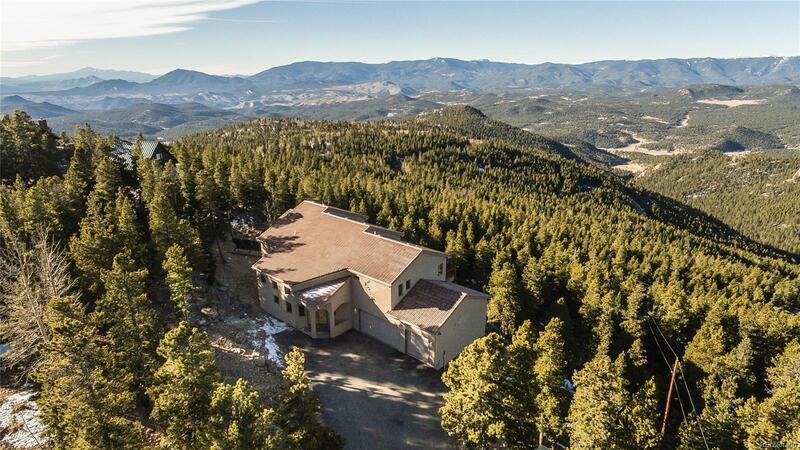 Captivating, million dollar 180* panoramic & dramatic snow-capped views including Mt Evans, Lions Head & Pikes Peak. Quality craftsmanship & attention to detail including a fully OWNED solar thermal 500-gal system w/NEW panels to support the radiant floor heating & passive solar. Enjoy an exceptionally beautiful home w/LOW utilities all year round. Artfully crafted details include architectural arches, welcoming foyer, soaring ceilings, views throughout, alder wood trim w/matching alder cabinets in kitchen & bath & wood beams. Soak up the views & enjoy the local wildlife from the towering decks. Entertaining amenities includes a model floor plan, lower level wet bar, game room & decks. Adore the beautiful kitchen w/granite counter tops, stainless steel appliances & views. Enjoy mountain living w/minimal exterior maintenance- stucco exterior & concrete roof tiles. Situated on a dramatic, south facing lot at the end of a cul-de-sac. Big storage area & 3 car garage.